Inaugurating the workshop Provincial Education and Cultural Affairs Ministry Secretary Mr.R.Thiagalingam said cultural activities would play a vital role in bringing unity between various communities. Protecting the cultural and traditional cultural values of the community lies in the hands of cultural officers, he added. MDTD Director and Deputy Chief Secretary of the North East Provincial Council Mr.S.Krishnanantham made the welcome speech. He said humanism could be developed through culture and not by economic and social development. Assistant Director of Cultural Affairs (Muslim unit) Mr.M.A.M. 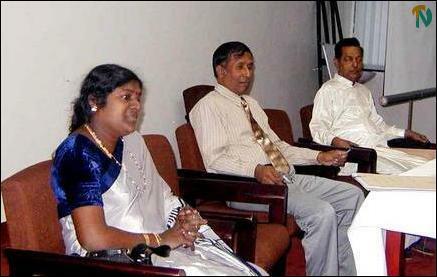 Majeed described the cultural links between Tamils and Muslims in the northeast province. Assistant Director of Cultural Affairs (Tamil) Ms N.Sri Devi spoke on the role of cultural officers in developing the human values. Mr. Collin Stephen of MDTD acted as co-ordinator of the workshop.